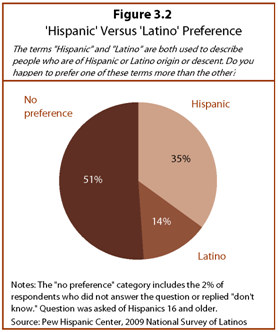 Hispanics in the United States have several options when it comes to describing their identity. They can use an ethnic label such as “Hispanic” or “Latino”; they can use their family’s country of origin; or they can call themselves “American.” The National Survey of Latinos finds that most have used all of these descriptors at one time or another. But it also finds that their first choice by far is their family’s country of origin. This chapter explores the many ways Latino youths identify themselves, including by race, ethnicity, and nationality. It also examines how they have been socialized by their parents in ways that relate to their sense of identity. And it reports their views about whether or not there is a common culture among Hispanics in the U.S. 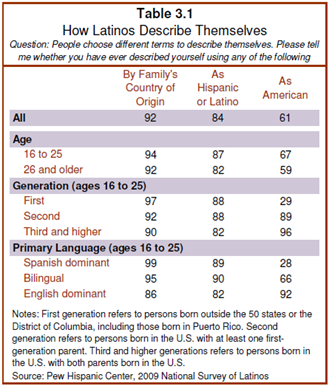 When asked about the terms they ever use to describe themselves, 94% of Latinos ages 16 to 25 say they have used their family’s country of origin, 87% say the terms “Hispanic” or “Latino,” and 67% say “American.” There are small differences in these shares between younger respondents and those who are ages 26 and older, but the basic pattern is the same. Not surprisingly, the use of the term “American” is more prevalent among native-born Latino youths than among the foreign born. Virtually all (96%) third-generation Latino youths and nearly nine-in-ten (89%) second-generation Latino youths say that they have described themselves as American. Among foreign-born Latino youths, fewer than three-in-ten (29%) say the same. To foreign born Latinos ages 16 to 25, citizenship is correlated with a stronger U.S. identity; those who are U.S. citizens are more than twice as likely as those who aren’t to describe themselves as American: 53% versus 19%. This pattern holds even once the number of years an immigrant has been in the United States is taken into account. Use of the term “American” also varies with patterns of language dominance. More than nine-in-ten (92%) young Latinos who predominantly speak English say they use the term to describe themselves. This share falls to two-thirds (66%) among predominantly bilingual young Latinos and to less than three-in-ten (28%) among young Latinos who predominantly speak Spanish. Asked which term they generally use first to describe themselves, young Hispanics show a strong preference for their family’s country of origin (52%) over American (24%) or Hispanic or Latino (20%). There is virtually no difference on this question between Hispanic youths and Latinos ages 26 and older. 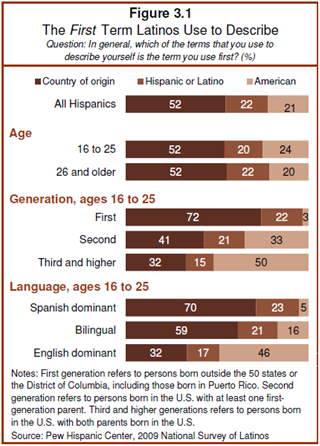 As might be expected, the term young Latinos use first is strongly related to their generation. 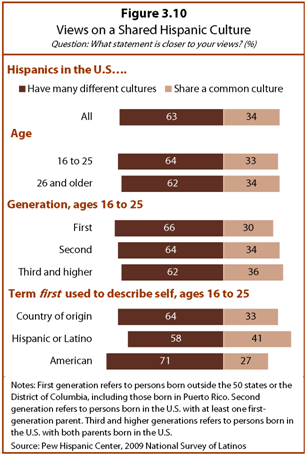 More than seven-in-ten (72%) foreign-born young Latinos say they describe themselves first by their country of origin. Yet significant minorities of native-born young Latinos also say they use their country of origin first when describing their identity. A plurality of second-generation (41%) and nearly one-third (32%) of third-generation young Latinos say this. It is only among third-generation young Hispanics that the term “American” becomes the first option. Within this group, half (50%) say they use American first, while one-third (33%) of the second generation and virtually no (3%) foreign-born young Hispanics say the same. These patterns in the first use of the terms “country of origin” and “American” are also linked to language dominance patterns. Seven-in-ten (70%) Spanish-dominant young Latinos say they use their country of origin first, compared with six-in-ten (60%) bilingual young Latinos and nearly a third (32%) of English-dominant young Latinos. A similar, but reversed, pattern holds regarding the use of “American.” Nearly half (46%) of English-dominant young Latinos say they use “American” first, while just 16% of bilingual and 5% of Spanish-dominant young Latinos say the same. Most Latinos (84%) say they have used the terms “Hispanic” or “Latino” to describe themselves, but they don’t appear to have a strong attachment to either one. Asked which of the two they prefer, half (51%) say they have no preference, one-in-three (35%) say they prefer “Hispanic” and one-in-seven (14%) say they prefer “Latino.” The large “no preference” response is not surprising in light of the fact that only about one-in-five Latinos say that either term is their first option when identifying themselves. “Hispanic” and “Latino” are terms used by the U.S. Census Bureau and other government agencies as well as by the media, civic groups, political leaders, and scholars in this country. These terms are not as widely used in any of the world’s Spanish-speaking countries. 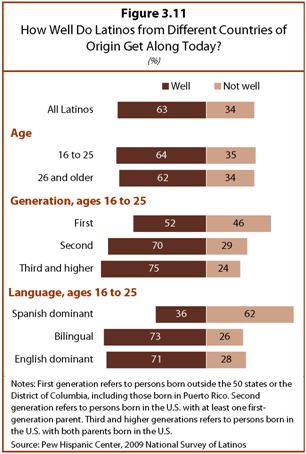 Young Hispanics see their racial identity somewhat differently than do older Hispanics. While only 16% of young Hispanics say their race is white, nearly twice as many (30%) Hispanics ages 26 and older identify their race as white. Yet even among these older Hispanics, a majority say their race is either Hispanic or Latino (36%) or some other race (25%). 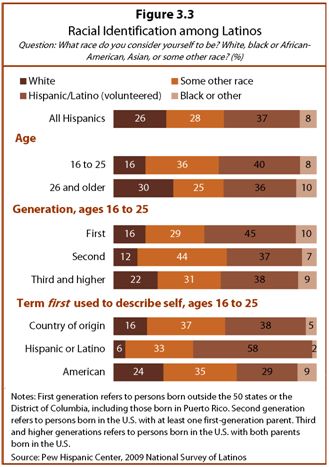 Patterns of racial identification vary among Latino youths. More than four-in-ten (44%) second-generation young Latinos identify their race as “some other race.” This is higher than the share of first-generation young Latinos (29%) or third-generation young Latinos (31%) who say the same. In contrast, 45% of foreign-born young Latinos volunteer that their race is Hispanic or Latino, compared with 37% of second-generation and 38% of third-generation young Latinos. In all cases, very few young Latinos identify their race as white or black. The way today’s young Latinos choose to describe themselves is linked to a series of identity and cultural signals they received from their parents. Young Latinos are more likely than older Latinos to say their parents socialized them more with a Hispanic focus than an American focus. Six-in-ten (60%) young Latinos say their parents often encouraged them to speak Spanish, compared with less than half (47%) of older Latinos who say that. At the same time, just 22% of young Latinos say their parents often encouraged them to speak only English, compared with more than a third (34%) of older Latinos who say the same. These differences in parental encouragement of language use persist even when controlling for immigrant status. Young native-born Latinos are more likely than older native-born Latinos to have been encouraged often by their parents to speak Spanish—51% versus 40%. Among the foreign born, more than eight-in-ten (84%) young immigrant Latinos say their parents often encouraged them to speak Spanish, while only about seven-in-ten (69%) older immigrant Latinos say the same. The survey also finds that today’s older Latinos report being raised by their parents with a stronger sense of pride in being American than today’s younger Latinos report receiving from their parents. Nearly four-in-ten (39%) Latinos ages 26 and older say their parents talked often about their pride in being American; fewer than three-in-ten (29%) young Latinos (ages 16 to 25) say the same. Among young Latinos, differences in parental socialization are evident by generation. Not surprisingly, the parents of foreign-born young Latinos are more likely to often encourage them to speak Spanish than are the parents of native-born young Latinos. 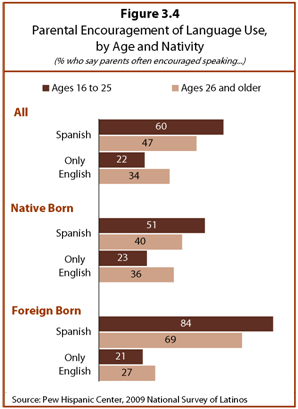 More than eight-in-ten (84%) immigrant youths say their parents encouraged them to speak Spanish often. Six-in-ten (60%) second-generation young Latinos and one-in-three (33%) third-generation young Latinos say the same. While large shares of first- and second-generation Latinos say their parents encouraged them often to speak Spanish, significantly smaller shares say their parents encouraged them to speak only English. Just 21% of immigrant young Latinos and 18% of second-generation young Latinos say their parents often encouraged them to speak only English. Among third-generation young Latinos, more than three-in-ten (31%) say the same. As expected, young foreign-born Latinos are more likely than native-born young Latinos to say their parents often emphasized pride in their country of origin. More than half (51%) of immigrant young Latinos say this, compared with less than four-in-ten (39%) second-generation Latinos and 35% of third-generation Latinos who say the same. In contrast, third-generation young Hispanics are more likely than first- or second-generation young Hispanics to say their parents often talked about their pride in being American. Nearly half (49%) of third-generation young Hispanics say this, compared with less than one-quarter (24%) of second-generation and one-in-five (20%) immigrant young Hispanics who say the same. Young Latinos who say they first describe themselves by their family’s country of origin have had a different parental socialization experience than young Latinos who first describe themselves as American. Unsurprisingly, three-quarters (75%) of young Latinos who use their country of origin first to describe themselves say their parents often encouraged them to speak Spanish. Among young Latinos who use Hispanic or Latino as their first identifier, less than six-in-ten (59%) say the same. And among those who use American first, just 37% say their parents often encouraged them to speak Spanish. 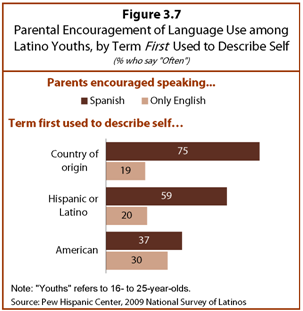 Yet no matter which term young Latinos use first to describe themselves, fewer say their parents encouraged them often to speak only English than say their parents encouraged them to speak Spanish. This gap is smallest among young Latinos who call themselves American first. Some 30% of this group says their parents encouraged them to speak only English, while 37% say their parents often encouraged them to speak Spanish. 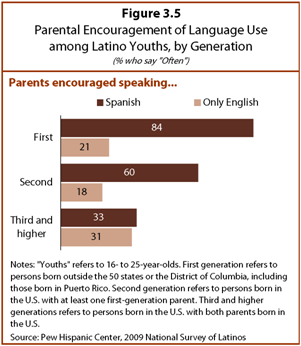 As for those who first identify by their family’s country of origin or as Hispanic or Latino, only about one-in-five Latino youths say their parents often encouraged them to speak only English. 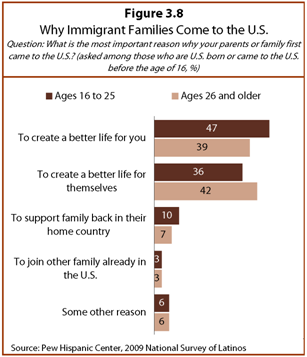 Asked why they and/or their families immigrated to the United States, survey respondents most often cited a desire to create a better life for themselves or their children. Among young immigrant Hispanics, a significant share also say they came here to help support family in their home country. 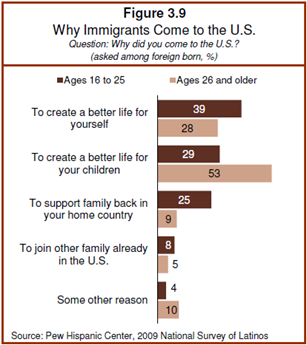 Among immigrants 16 to 25 years old, a slightly different mix of motivations is cited. Nearly four-in-ten (39%) young immigrants say they came to the U.S. to make a better life for themselves. This is followed by 29% who say they immigrated to make a better life for their children and 25% who say they came to help support family in their home country. Older immigrants, 26 and older, express a similar set of motivations, but ranked differently. More than half (53%) say they came to the U.S. to make a better life for their children. This is followed by 28% who say they came to the U.S. to make a better life for themselves and just 9% who say they came to the U.S. to support family in their home country. For Latinos, the question of ethnic and racial identity is complicated by the fact that a large majority see more cultural differences than commonalities among Latinos who live in the Unites States. Asked to choose between two statements about Latinos—one asserting their shared culture and the other asserting their different cultures—young Latinos picked the second statement by a ratio of nearly two-to-one (64% versus 33%). There are virtually no differences on this question by age group or by immigrant generation among young Latinos. Not surprisingly, young Latinos most inclined to see a shared culture among Latinos are those who use the terms “Hispanic” or “Latino” first when describing themselves. However, even among this group, nearly six-in-ten (58%) say they see more internal differences than commonalities among Hispanics in the U.S.
Nearly two-thirds of Hispanics in the U.S. are from the same country of origin—Mexico—while the remaining third trace their roots to any of about two dozen Spanish-speaking countries (Pew Hispanic Center, 2009). Given this diversity, how well do Hispanics from different backgrounds get along with one another? Overall, young Hispanics see more harmony than conflict; nearly two-thirds of Hispanic youths (64%) say Latinos from different countries of origin get along well, while more than a third (35%) say they do not. Similar shares of adult Hispanics say the same. However, there are some sharp variances on this question—especially by language usage. Among young Latinos who predominantly speak Spanish, just 36% say that Hispanics from different countries of origin get along well. In contrast, more than seven-in-ten of those who are bilingual (73%) or predominantly speak English (71%) see harmony among Hispanic communities from different countries of origin. Young Latinos from families with more generations in the U.S. are more likely than immigrants to say that Hispanics are getting along well these days. More than seven-in-ten second-generation (70%) and third-generation (75%) young Hispanics say this, while just over half (52%) of foreign-born young Hispanics say the same.